At a press conference on Wednesday, Texas football coach Tom Herman chatted about the additions of Bru McCoy and Javonne Shepherd to his 2019 recruiting class. He, however, was not able to discuss all of his incoming recruits. Since they have not enrolled yet, Herman said he is not allowed to discuss his preferred walk-ons by name. Walk-ons aren’t on scholarship, but they are recruited and guaranteed a spot on UT’s roster. The walk-ons do have a chance to eventually earn scholarships and playing time — senior Jarmarquis Durst earned both of those things last year — but they are generally used to give competitive looks to UT’s starters in practice. On Wednesday, Herman wanted to “take a second to brag on our walk-on program.” Herman credited Bob Shipley, UT’s director of high school relations, and John Michael Jones, an assistant director of player personnel, with shepherding the walk-on program. Herman also pointed out that many of UT’s incoming walk-ons chose having to pay to play at Texas over actual scholarship offers. “The tie to Texas certainly helps, because I think when you bleed burnt orange, it’s a lot easier to take that path as a walk-on,” Herman said. “To know that you’re going to have to fight, scratch, claw, and do everything that you can to earn your way on to the field for the University of Texas. But for them, for the most part, all of that is worth it. St. Michael’s QB Sam Saxton: 247Sports reports that Saxton had offers from over a dozen schools including Memphis, Tulane and Rutgers. The grandson of legendary Longhorn James Saxton, Sam was once committed to Southern Miss. Westlake LB Jake Ehlinger: The football programs at Brown, Incarnate Word and Penn had been interested in Ehlinger’s services. He will instead join his older brother, Sam, at Texas. Strake Jesuit LB Jett Bush: 247Sports reports that Bush also had offers from Air Force Army, Columbia and Cornell. He was committed to New Mexico State at one time. 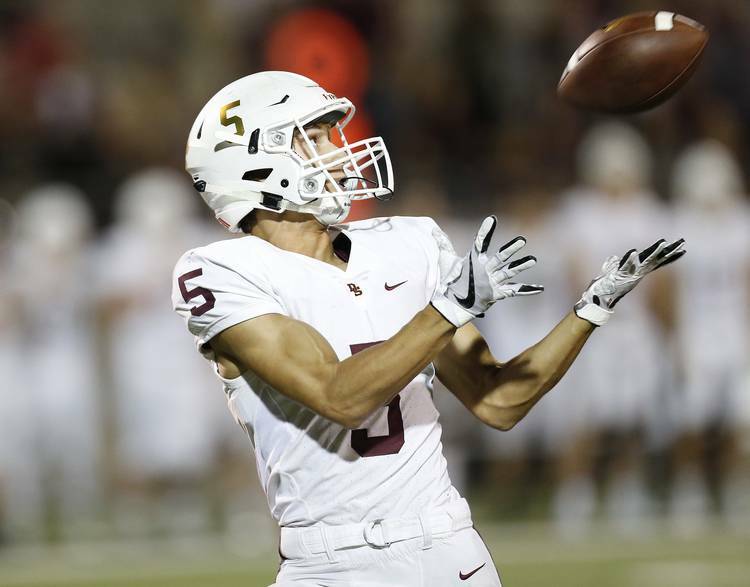 Dripping Springs WR Parker Alford: Louisville offered a scholarship to Alford this past summer. A two-star prospect in 247Sports’ composite rankings with family ties to Texas, Alford caught eight touchdowns in each of his last two seasons. Cy Springs CB Myles Mass: 247Sports reported that Mass also had scholarship offers from Air Force and Army. He was considered a two-star prospect in the website’s composite rankings. Westlake DB Doak Wilson: This past spring, Wilson reported an offer from Air Force. Lake Travis OL Chad Wolf: Wolf had previously reported an offer from the Colorado School of Mines. Houston Village School TE Austin Hill: 247Sports rates Hill as a two-star prospect in its composite rankings. During his senior year, he reported offers from Drake, Columbia, Davidson and Florida Tech. Odessa Permian DB Christian Tschauner ll: Last month, Tschauner was presented an offer by Air Force. He had also been recruited by Davidson, UT-Permian Basin and Montana-based NAIA powerhouse Carroll College. Leander Glenn TE Nathan Hatter: A local product, Hatter had previously reported offers from Trinity University and TAMU-Commerce.